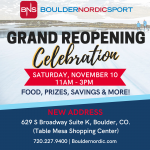 Boulder Nordic Sport (BNS) is gearing up for our annual ski picking trip and now is the time to place your pre-order for next season’s hand-selected skis. This June, BNS is sending Nathan Schultz, David Chamberlain and Roger Knight to hand-pick next season’s inventory and to confer directly with the ski manufacturers. This trip not only ensures that BNS has the highest-quality stock available but also enables our staff to have first-hand knowledge of what is going on with the world’s leading ski companies. Boulder Nordic Sport is teaming up with Sparks Expeditions for an all-new junior training camp in Europe this summer. Skiers will experience three different training venues over the duration of the camp, two of which offer opportunities to be on-snow. In combining BNS’ expert staff with Sparks Expeditions’ proven record of overseas training camps, this is a unique chance not only to become a better skier but a more rounded athlete and person. Boulder Nordic Sport (BNS) is at the West Yellowstone Ski Festival. Our staff will be on-site and focused on education and helping skiers with skis, wax and equipment. BNS will not have a stone grinder on-site this year, but the BNS Mobile trailer will be located at the trailhead and BNS staff will be at the Expo for wax and ski support. BNS staff will also be collecting skis in West Yellowstone to bring back to the Boulder and Minneapolis shops for service work. To arrange pickup or drop off, contact BNS at the in-town trailhead area. Boulder Nordic Sport (BNS) is excited to announce their sponsorship of Devil’s Thumb Ranch and Winter Park, Colorado’s new event: The Stagecoach Classic, a point-to-point classic technique-only race starting at Devil’s Thumb and ending in downtown Winter Park. Taking place on Saturday, January 25, the event will include a 30km classic cross-country ski race with cash prizes, 15km classic tour, a kids’ race and more. There is more fun after the race in Winter Park, with a BBQ, live music and beer garden from Great Divide Brewery. There will also be an after party cocktail hour at Devil’s Thumb Ranch.